INTRODUCTION: Laparoscopically, exact border of the gastric submucosal tumor is hard to determine. This makes laparoscopic wedge resection of these tumors difficult. This often leads to resection of larger gastric area then necessary, which can lead to gastric dysfunction and stenosis postoperatively. To overcome this Hiki et al proposed a method called Laparoscopic Endoscopic Cooperative Surgery (LECS) in 2007, which combined intraluminal endoscopy and laparoscopic method for resection of the submucosal tumors, and has been gaining popularity in Japan. Our center has been routinely applying this method for gastric submucosal tumors since May 2010. We would like to share our experience on this procedure. METHODS AND PROCEDURES: The location of the tumor is confirmed laparoscopically and endoscopically. Blood vessels and other tissues near the tumors are then dissected laparoscopically. Once the tumor area is skeletonized, endoscopist mark the mucous layer around the tumor using needle knife. Glycerine dyed with ink is then injected in submucosal layer. Then IT knife is used to dissect the mucous layer around the tumor. After this, IT knife is used to cut through the whole layer of gastric wall from the caudal side of the tumor along the cut edge of mucosa. This procedure is assisted laparoscopically and is continued until the tumor can be overturned into abdominal cavity. Rest of the gastic wall around the tumor is dissected using ultrasonic coagulating shears and the tumor is placed in the collection bag. The defect area is generally closed by intracorporal continuous suture using absorbable sutures for the mucosal layer and interrupted suture of non-absorbable sutures for serous and muscular layer. In the case of GIST with ulcerative lesions, we apply modified version, taking in consideration the risk of dissemination. After the location of tumor is confirmed, glycerin dyed with ink is injected endoscopicaly in the submucosal layer of the. Serous and muscular layer around the tumor is dissected laparoscopically until we reach the submucosal layer. Once submucosal layer is exposed all around the tumor, the tumor is pulled outwards towards the intra-abdominal cavity and the mucosa around the tumor is closed using the stapler. We add interrupted sutures in serosal and muscular layer if not closed by the stapler. In each case endoscopy is performed after the closure to confirm that there is no bleeding or leakage of the closure site or stenosis of stomach. We finish the procedure after confirming that there is no bleeding intra-abdominally. 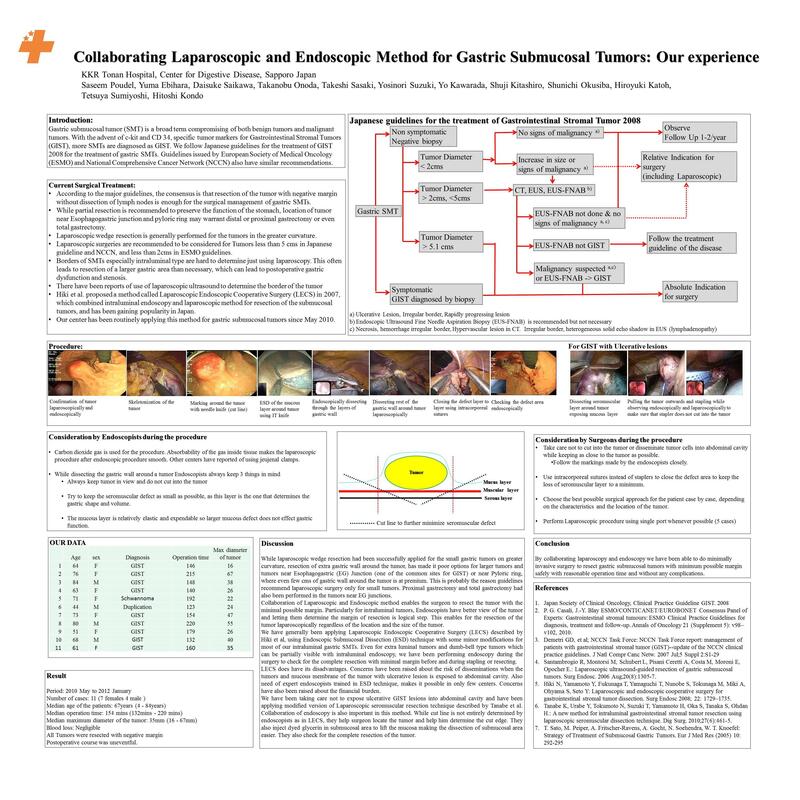 CONCLUSION By collaboration of endoscopy and laparoscopy we have been able to do minimally invasive surgery to resect gastric submucosal tumors with minimum possible margin safely and have been able to preserve the function of stomach.